Blue Days, black nights is a self-portrait. 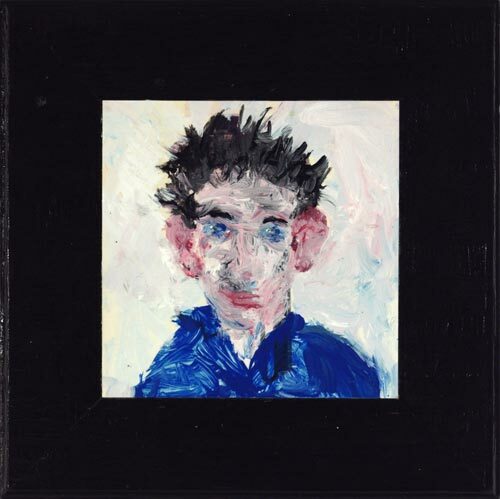 Neil Evans was also represented in the 2002 Archibald Prize with another tiny painting of himself. “This one is a little bit bigger,” he says. When Evans started painting it was predominantly on small pieces of card. “I was a conceptual artist initially, then I retired and became a picture framer. I didn’t like throwing so much card and glass away so I would use it to paint on,” he explains. The title of this self-portrait refers to the chronic pain Evans has lived with for the past 18 months because of a frozen shoulder. “It’s bad during the day and at night I have trouble sleeping,” he says. “The title actually comes from a song that Buddy Holly recorded. The frame, which is part of the painting, is black and the shirt and the eyes are blue. Evans doesn’t paint many portraits – he specialises mostly in landscapes – but he enjoys tackling portraiture occasionally and usually paints one for the Archibald. Born in Sydney, Evans was a conceptual artist from 1970 to 1972. He is the manager of Sydney’s Legge Gallery and has had 11 solo exhibitions there since 1991. He won the People’s Choice Award at the 2007 Woollahra Small Sculpture Prize and was a finalist in the 2007 Waverley Art Prize, the 2005 Wynne Prize, the 2000 Sulman Prize, the Kings School Art Prize in 1997 and 2007 and the SCEGGS Redlands Art Prize in 1997, 1999 and 2005.